Most of the internet users using Gmail for mailing and chatting with others. And Google+ is a very fastest growing social website owned by Google. Online Chat is a common feature in both services. Chat for Google offers to you make a chat with your Gmail and Google+ friends without opening the respective sites. 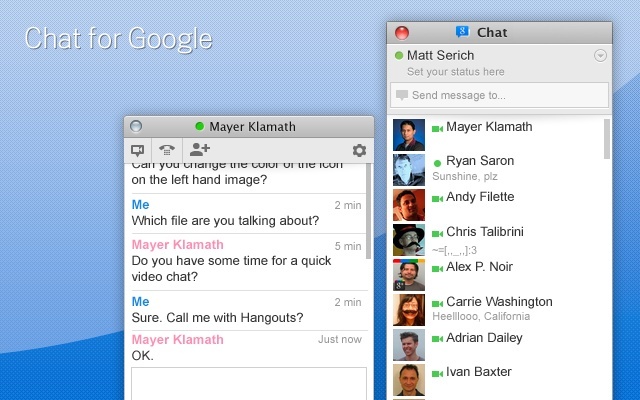 You can chat with your friends any where on the web in Google Chrome by this cool extension. Go to this link to download the Chat for Google extension to your computer. After you installed this extension the chat for icon shows in Chrome bar and you system tray just click the icon. If you already sign in any Google account in your browser the chat window shows your friends other wise just sign in to your Google account through this chat window. Now you can chat with your friends any where on the web and also you can hangout your Google+ friends any where on the web. Go to setting ==> Options page you can control this extension features.